Autumn Queen does focus on the season with that name, and it does have a queen on its reels, one which appears to be taken directly out of some fantasy book. 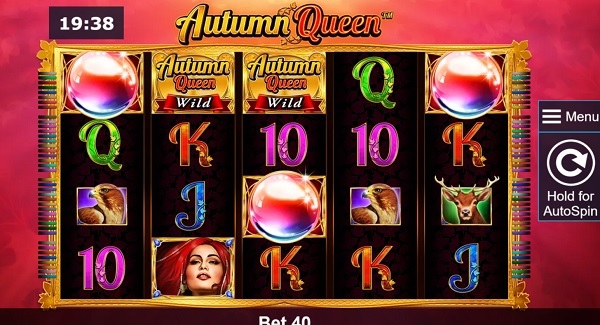 This slot machine, which was recently announced by Novomatic, delivers a design which shows off the fantasy side a bit, but which also has a range of wild animals that you might expect to be subjects of the Autumn Queen. The game has 40 lines total, 5×4 reels and it will deliver top payouts of 500 coins. As for the features found inside, you will get wild symbols, stacked scatter symbols and free spins which can bring additional stacked icons. There are parts of the design that were properly themed and well chosen, and those I enjoyed very much. I would include in this list the images of the Autumn Queen, showing a beautiful redhead, as well as her crystal orb, the bear, falcon, deer and even the logo of the game. The far less interesting symbols available here were the ones who had images of the poker cards. The image in the background is somewhat appropriate, but it’s still just an abstract picture with shades of red and orange in it, and a beautiful forest would’ve been more appreciated. Out of the two feature symbols which Autumn Queen relies on, the wild logo is the one that is the most common, in the way it works for you. These wild symbols are only used as substitutes in this game, useful only if they land together with regular symbols that match, forming combinations with them. They can’t replace scatters, and they can’t form combinations by themselves either, apparently. I found the scattered Crystal Orb to be a far more interesting symbol to get here. First of all, it’s a scatter symbol that comes stacked, so you’re not limited to a maximum of five symbols on the reels, like in most slots. Here, the minimum requirement is to have five scatters present, arranged from the left to the right, and you will trigger free spins this way. The initial 5 scatters will get you the first 5 free spins, while each additional scatter present on the reels after that will add another 5 spins. With all 20 positions occupied by scatters, you can have up to 80 free spins triggered. The extra feature available here will give you additional stacked symbols, chosen from the regular ones. Thanks to all those colorful poker icons, the design feels incomplete, especially since the background is only showing you colors. Autumn Queen will give you features that are not quite standard, along with good graphics, but overall I’ve seen better titles from Genesis Gaming.